Over the past 19 years, the Flower City Garden Contest has recognized the efforts of hundreds of gardeners dedicated to making Rochester greener, cleaner, and more beautiful. 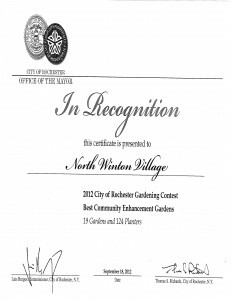 Winners of the Summer 2012 content include your North Winton Village Association and the Winfield Grill! Charlotte-Genesee Lighthouse War of 1812 Bicentennial Peace Garden, 70 Lighthouse St. While the summer contest is over, nominations and entries for the winter Flower City Garden Contest are due February 26, 2013.